I would recommend MOJO to anyone! They truly took the time to discuss pricing and availability to fit our exact needs! They arrived on time and delivered excellent service! The quality of our photos were great and we received an email with a link to everything right after the wedding! The attendant was fabulous and made it fun for everyone! I hope to use them for more events in the future! If you are debating doing a photo booth.. You really should choose MOJO for an affordable yet quality service! Thanks Megan! So glad we could be a part of your wedding reception. MOJO Booth were awesome! We enjoyed the photobooth and so did our guests! They couldn't stop taking pictures! We were very please with their services! If your a bride who loves pictures, photo albums, and all-- definitely get the scrapbook/guest book for your guests to sign! We love ours so much! So glad you and your guests enjoyed the photo booth. Your scrapbook turned out amazing! Congrats on your beautiful wedding. What a wonderful thing for a wedding. Our guests raved about the photo booth and we have a beautiful photo book to commemorate the occasion. I loved working with Mojo Photo booth! They were very responsive to my emails and willing to explain all of the little details with me. I loved the photos that were produced during the reception and our guests loved being able to have a copy to take home. My husband and I held our wedding reception at Rosen Shingle Creek on June 22,2013. I was lucky enough to win a Mojo Photo booth at a bridal show. Mojo was always there to answer questions and made our photo “thank you post card” customized to us. They were set up and delivered on time and were very professional yet young and fun. Our guests had so much time taking pictures with props. You are also given a code to enter online and you can see everyone photos! I would recommend Mojo hands down! It made our wedding that much better! So glad we were able to be a part of your wedding. Thanks for taking the time to write this detailed review. Wishing you and your husband all the best. Mojo booth was great to work with and was a great price. I knew I wanted a photobooth for our New Years Eve wedding and I am so glad we went with Mojo booth. They have a great set-up and the booth is large enough to hold more than just 2 people. The attendant was friendly, the booth was busy throughout the reception and the guests really enjoyed it. The photobooth attendant made sure that we (bride and groom) came over and used the booth, which was nice because we might have missed out. We just had a chance to read through the photobooth scrapbook and all of the pictures were hilarious. Thank you MOJO for providing such great fun at our wedding! Your staff is awesome and the pictures are all so cute! The booth gave us a chance to just be silly! We have a hilarious photo album that we will enjoy for a long long time. We loved mojo!!! Everything was perfect. Rebecca was professional and handled everything perfectly. The attendants were so nice and helpful also. The only bad part is that we were so busy running around that we didn't get to use the booth as much as we wanted but, because of that I can't wait to book them again. I truly recommend mojo photobooth. I'm so glad I decided to have the photobooth at my wedding reception.It was so much fun to have Mojo photobooth there. Everyone there enjoyed the photobooth. The staff there was friendly and fun. I feel like I received a great deal overall. 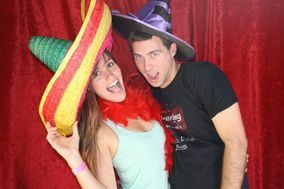 I would definitely recommend Mojo photo booth to anyone who wants to add some more fun to their event. Mojo Photo Booth was amazing! They were very easy to work with. My guests are still talking about their professionalism and great customer service. I highly recommend this company! Mojo Photo Booth and Rebecca were so professional and easy to work with. Our photo booth was a hit! The staff was so courteous and our memory book still makes us smile. Our MOJO Photobooth was the hit of our wedding reception! All the guests had a blast and went home with several pictures! Mojo was professional and immediately responded to any of our questions or emails, and we felt that we definitely got our money's worth for their price. It was a pleasure having them at our wedding! I have already recommended their company to other friends having weddings in the future!! Mojo Photobooth was set up on time and very professional! We even received a thank you from them after. They post all photobooth pictures online and they are free to download. It was a big hit at the wedding! Everyone loves photobooths! I recommend using them! Great service. The photos were excellent. They customized the photo layout with our logo and event name. The staff was very professional. The booth is big enough to fit 3-4 people, props were available at all time, and the quality of the pictures was excellent. We got all the pictures from the event, and we are planning to use them in social media and newsletter. Very friendly and willing to work with us last minute! What an amazing company! They provide such a fun element for our Business After Hours event. Everyone had a blast. They were so flexible with the layout of the photos and design which was much appreciated! Look forward to working with them again! Best idea ever for my twins 16th bday! Mojo Photo Booth was very reliable, professional and affordable and perfect for this special day! Mojo photo booth was wonderful! They were easy to make arrangements with and needed no day of support. They came in a were completely self sufficient. All of our guest loved the photo booth and the line moved very quickly whenever there was one.